are described in Section 20.3 (subroutines SPHGRD, SPHPLT, and SPHCNV). Interpretation and terminology for the underlying coordinate system is given in Section 2.1. 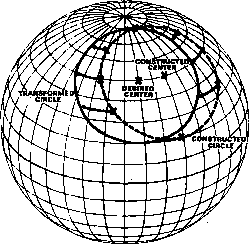 For most applications related to attitude geometry, the spacecraft is thought of as being at the center of the globe. 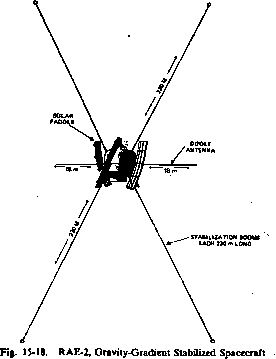 Therefore, an arrow drawn on the globe's equator from right to left would be viewed by an observer on the spacecraft as going from left to right. This geometrical reversal is illustrated in Figs. 4-3 and 4-4, which show the Earth as a globe viewed from space and as viewed on the spacecraft-centered celestial sphere. Similarly, Figs. 11-25 and 11-26 show the orbit of the Earth about the spacecraft as viewed by the spacecraft. This spacecraft-centered geometry allows a rapid interpretation of spacecraft observations and attitude-related geometry. reproduction by interested users. (For accurate construction, the globes must be reproduced to the same size as nearly as possible. Therefore, reproductions of the different projections should be made at the same time on the same equipment) Coordinate lines are at 10-deg intervals in latitude and longitude except within 10 deg of the poles, where the longitude intervals are 30 deg. The globe originals are handdrawn and are accurate to about 1 deg in the central regions and 2 deg near the perimeter. underlying coordinate grid has been rotated about 120 deg counterclockwise and the triangle/circle pattern has been left unchanged. Thus, in the new coordinate system (viewed by rotating the page 120 deg clockwise), we have constructed a small circle with a 20-deg angular radius centered at about 21 deg below the equator. 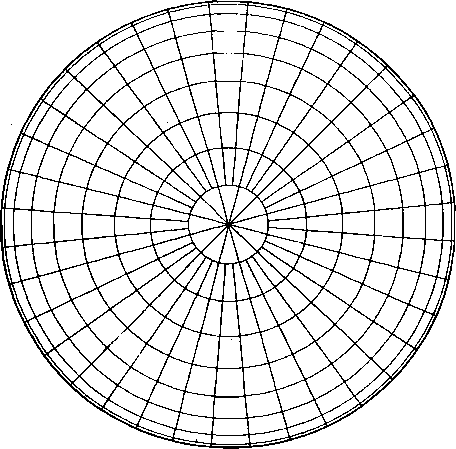 By rotating the underlying grid an appropriate amount, we could center the small circle at any desired latitude. 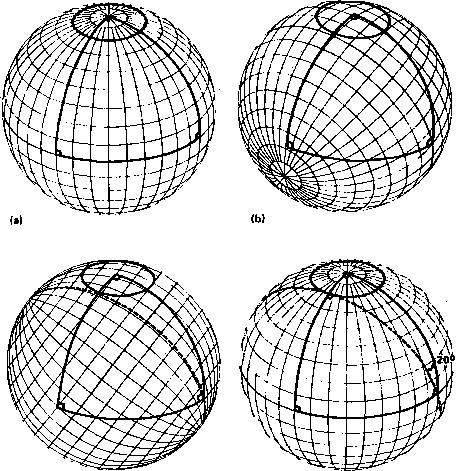 Because of the symmetry of the underlying sphere, we may not only rotate the grid pattern, but also interchange the underlying grids among the four shown in Figs. B-l through B-4. For example, Fig. B-5(c) shows the circle/triangle pattern with the underlying grid changed to the equatorial view and rotated somewhat counterclockwise. (Again, the grid may be rotated to any convenient angle.) The meridian lines on the grid pattern, along with the imaginary meridians between those that are shown, are great circles. Therefore, in Fig. B-5(c), the dashed line is a great circle passing through one vertex of the triangle and tangent to the small circle. Finally, in Fig. B-5(d), we have left the constructed figures unchanged and returned the underlying grid pattern to its original orientation from Fig. B-5(a). Fig. B-5. 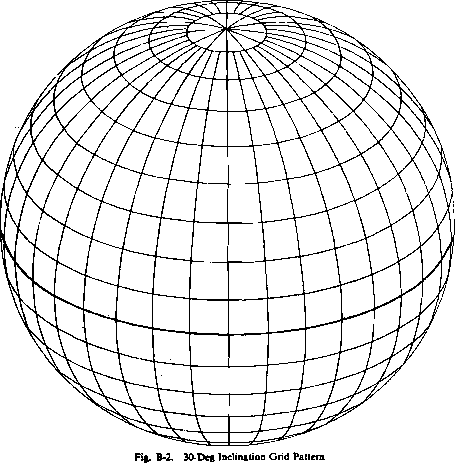 Construction of Global Geometry Plots. See text for explanation. Thus, by using the grid pattern of Fig. B-l, we have constructed a great circle tangent to a small circle of 20-deg radius about the pole or, equivalently, at an inclination of 70 deg to the equator. In practice, this construction is performed by first drawing the original figure of B-5(a), and then placing it on top of the equatorial view on a light table so that both grids can be seen. After rotating the grid patterns relative to each other until the desired orientation for the dashed curve is obtained, we can trace the dashed curve directly on the grid of Fig. B-5(a). 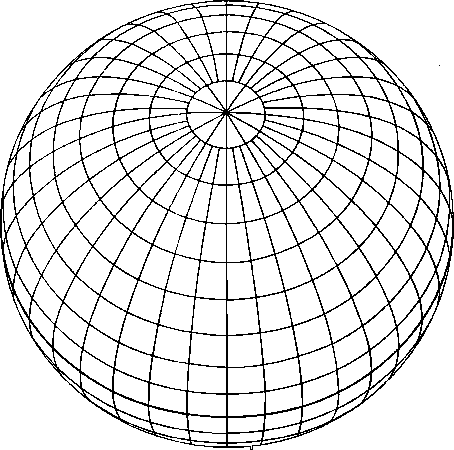 This general procedure for drawing great and small circles by superposing grids on a light table (or window) and rotating them until the desired orientation is obtained has been used to construct nearly all the globe figures in this book. Note that whenever figures are constructed using superposed grids, the centers of the two grids must be on top of each other or, equivalently, the perimeters of the two grids must be superposed. This principle of grid superposition can be applied to the construction of various figures, as discussed below. Constructing Great Circles Through Two Points. Figure B-l is the basic figure for constructing all great circles on the celestial sphere, because all possible great circles are represented by the meridian lines on the figure and the imaginary meridians between the ones drawn. 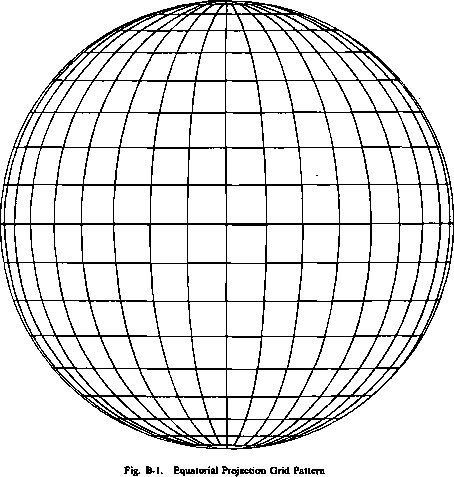 To construct a great circle between any two points of any of the globes, place the globe with the two points on top of a copy of Fig. B-l. Keeping the perimeters of the two figures superposed, rotate the globes relative to each other until the two points lie over the same meridian on the underneath grid. This meridian is then the great circle defined by the two points. Note that this great circle is most precisely defined when the two points are nearly 90 deg apart and is poorly defined if the two points are nearly 0 deg or 180 deg apart. Measuring Arc Lengths. The grid pattern in Fig. B-l can also be used to measure the arc-length separation between any two points on the sphere. The parallels of latitude (i.e., the horizontal straight lines in Fig. B-l) are separated by 10 deg of arc along each meridian. Therefore, to determine the arc length between two points, superpose the globe with the two points over a copy of Fig. B-l and rotate it until die meridian forming the great circle between the two points is found. The arc length is then determined by using the parallels of latitude along the meridian as a scale. For example, consider the dashed great circle in Fig. B-5(c). Because the triangle is a right equilateral triangle, the distance between any vertex and the opposite side must be 90 deg. This may be confirmed by counting the parallels of latitude along the dashed great circle. Also, the diameter of the small circle in Figs. B-S(b) and (c) may be measured along the meridian passing through the center of the circle. In both subfigures, the measured angular diameter is 40 deg, as required. Note that arc length must be measured along a great circle; it cannot be measured along parallels of latitude or other small circles. Constructing Great Circles From General Criteria. In general, any great circle is constructed by first finding two points on it and then drawing the great circle between these points. For example, to draw a great circle at a given inclination to the equator, first pick the intercept point on the equator. Measure along the equator to the right or the left (depending on the slope desired) 90 deg and then up from the equator (along a meridian) an angle equal to the inclination. This point and the intercept point on the equator define the great circle. This method could have been used to construct the dashed great circle in Fig. B-5(c) directly without considering the tangent to the small circle. Figure B-6 illustrates the procedure for constructing a great circle through a given point, A, perpendicular to a given great circle, AA'. Locate the point A' along the given great circle 90 deg from A by the method described above. Measure along the meridian through A' 90 deg in either direction to the point B. 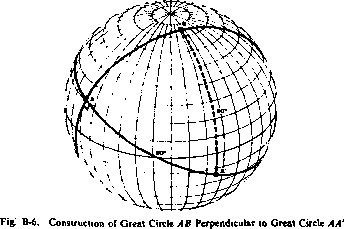 The great circle through A and B is perpendicular to A A'. small circles whose center is on the perimeter, 30 deg from the perimeter, 60 deg from the perimeter, or at the center. Small circles centered on the perimeter are straight lines on the plot and small circles centered in the middle of the plot are circles. The radius of the small circles constructed by this method is the colatitude (distance from the pole) of the parallel of latitude chosen on the underlying coordinate grid. For most purposes, one of these four sets of small circles is sufficient. They have been used for all of the constructions in this book. If it is necessary to construct a small circle at an intermediate arc distance from the perimeter, first construct a small circle of the desired radius at the desired latitude and as near the desired longitude as possible. Transform each point on this circle along a parallel of latitude a distance in longitude equal to the difference in longitude between the desired center and the constructed center. This procedure is illustrated in Fig. B-7.